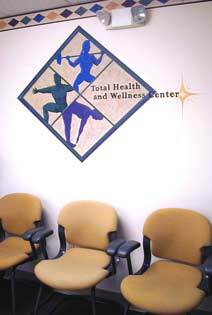 HNJH Wellness Center Mural and Interior Design Project. Helen Newberry Joy Hospital Interiors. A new addition to the Helen Newberry Joy Hospital in 2002 included Weight Lifting, Cardiovascular, Physical Therapy Rooms. With all the new space, they asked for my assitance on the interiors. With the help of the staff from all of the Wellness Center Departments, it was a great project with fun around every corner. Here you will see the finished product which includes a large logo mural and three other rooms with murals and "bagged walls" that coordinate with the border. Also see logo in the Business Identity section of this web site. Click here to visit the Helen Newberry Joy Website. 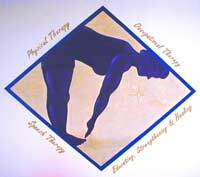 4' x 4' mural/logo symbolizing the healing process found within this department. Slowly reaching for their goals with the guidance of the HNJ Hospital Staff. 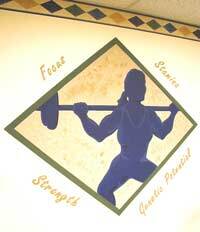 4' x 4' mural/logo symbolizing the energy of the Cardiovascular Room. 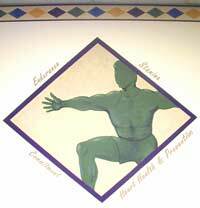 We used this symbol to motivate and energize. Inspirational words were also painted around the perimeter of the boarder. Weights are great and here men and women both are encouraged to work on their biceps! This room was done in a warm sage greens and the mural is 4'x4'. All focus walls were done with a bagging effects. Boarders complimented the four directions of the new Wellness Center. The Cardiovascular, The Weight Lifting, We kept a focus on the colors and geometric design. The Physical Therapy Room, and the Waiting Room were all completed in time for the Grand Opening. Decorating became a priority when opening the new Total Health and Wellness Center along with an established Rehabilitation Department. We knew we would need to be aesthetically pleasing in order to attract customers into a basement environment. Gina’s original artwork is the first thing seen when you enter the department and it gives us a professional touch. Gina helped the staff to turn an otherwise uninteresting environment into an oasis of color and artistic design. Our logo has been replicated onto our water bottles, T-shirts, pens, and business cards bringing our marketing fully into the spotlight. Men and women alike, comment on our invigorating colors and creative painting technique. We are very pleased with Gina’s ability to tie all our services together to create a common link yet still allow individuality with her logos, colors, and borders.